Kanafani was born in Akka to a prominent lawyer and started his studies at Les Frères, a French missionary school in Jaffa. His life changed significantly when he was twelve: After his family’s displacement to Beirut and then Syria in 1948, he continued his studies in Syria’s public schools, where he got a UNRWA teaching certificate. He attended Damascus University, where he studied in the Arabic literature department until, according to a profile that ran in As-Safir, he was expelled for political reasons. Initially, Kanafani worked as a teacher, leaving Damascus to work in Kuwait for five years as an Arts and PE teacher. Then, according to translator and scholar Roger Allen, the Popular Front for the Liberation of Palestine (PFLP)’s George Habash helped persuade Kanafani to move to Beirut, where the author worked on the al-Horria newspaper, and later al-Moharrer and al-Anwar, before becoming the well-known editor-in-chief of the PFLP’s weekly newspaper, al-Hadaf. 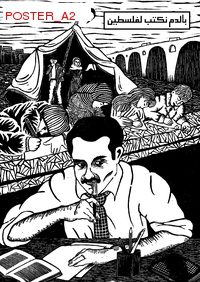 Even before he left to teach in Kuwait, Kanafani was writing and publishing stories. According to Kuwaiti writer Mai al-Nakib, Kanafani’s “The Stolen Shirt” won the Kuwait Literary Prize in 1958, when Kanafani was just twenty-two. His Men in the Sun, one of his most popular and acclaimed works, was originally published in 1956, followed by All That’s Left to You, Return to Haifa, and a number of other important works, including four collections of short stories. When Kanafani was assassinated in Beirut on July 8, 1972, he was just 36. Kanafani’s texts are still read, staged, discussed, debated, and incorporated into new works, as in Susan Abulhawa’s Mornings in Jenin and the short film Qarar Mujaz, or A Brief Conclusion.